Found on Nettle, Lancashire 21 June 09. Hi Buzz, welcome to DF. 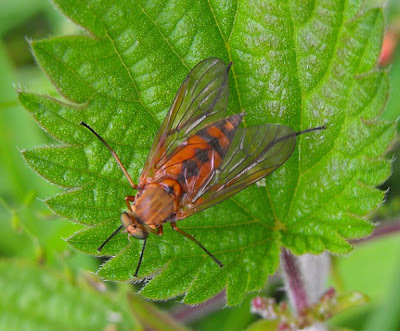 It's a snipe fly from the Rhagionidae family. Someone else will go further I'm sure, but what a pretty specimen! This is likely to be the common Rhagio tringarius, but there is another very rare species, Rhagio annulatus, which could not be distinguished from characters visible in this picture (in fact you would need to examine a specimen under a microscope to be sure).